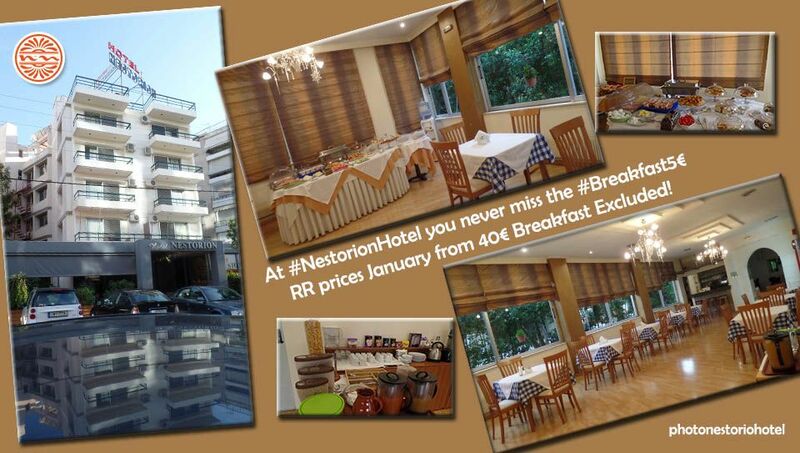 NESTORION Hotel is located within walking distance of large market shops, banks, ship companies and nightclubs. At NESTORION the visitor combines unique moments of relaxation, work, promenades along the sea line of Palaio Faliro the first part of the so called Athenian Riviera, Piraeus and entertainment in the vivid night life of the area. Photos here. 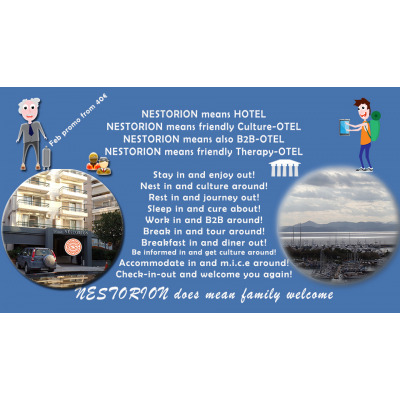 Near NESTORION are located the Maternity Hospital REA, the ONASSIS Cardiac Surgery Center, Athens Vision Eye Center, Medical Center of Paleo Faliro, METROPOLITAN HOSPITAL, the Eugenides Foundation / Planetarium (National & International Meeting Centre), The Metropolitan Hotel (national & International Meetings, Conferences, Congresses, Events, etc), the Cultural Center Stavros Niarchos Foundation, which includes the new National Opera and the New National Digital Library and innovative entertainment, ecological and educational park. 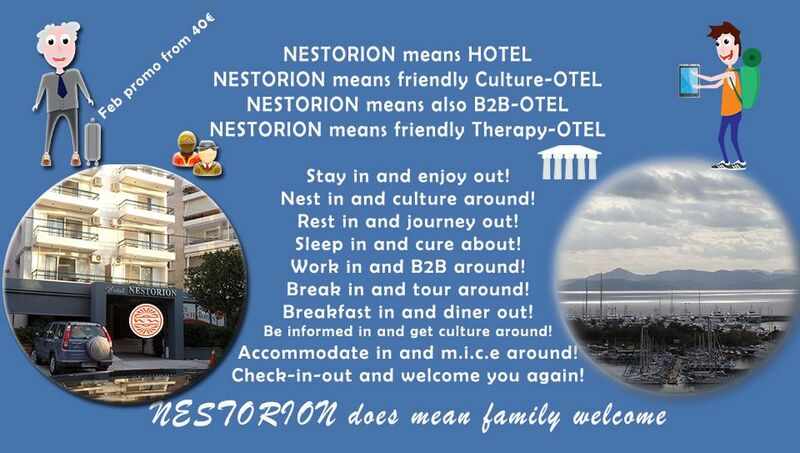 NESTORION is located one kilometers distance from the Cinema Village Faliro, Faliro Delta and beside to the Faliro Olympic Complex known as Olympic Tae Kwon Do or Faliro indoor hall and exhibition centre. Walking western along the Water Park you can enjoy a romantic promenade and then walk back and go eastern you can visit the decommissioned battleship "AVEROF" which has become a historical museum. Modern marina Flisvos then extends full network of food and entertaining outlets. Marina Floisvos has an extra eye-catching and playground infrastructure. Next Marina is Marina Alimos (the most important of Greece we could say). 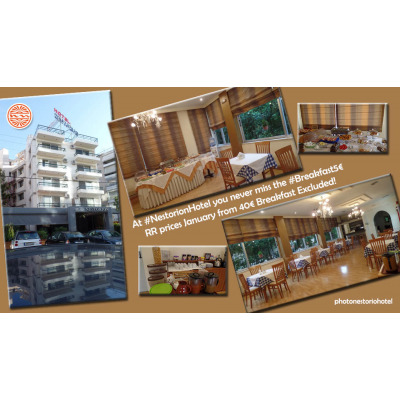 The walk can be completed with a visit round the Paleo Faliro Park, the best of Balkans, the local beach EDEN and the local market of Paleo Faliro along the Street of St. Alexander (Aghiou Alexandrou).